At Briscoe Search, we are always on the lookout for leadership thought on all things “career”. A few days ago, we came across this unique and well-written article by Tomas Chamarro-Premuzic, CEO of Hogan Assessments in the US and a regular contributor to HBR. 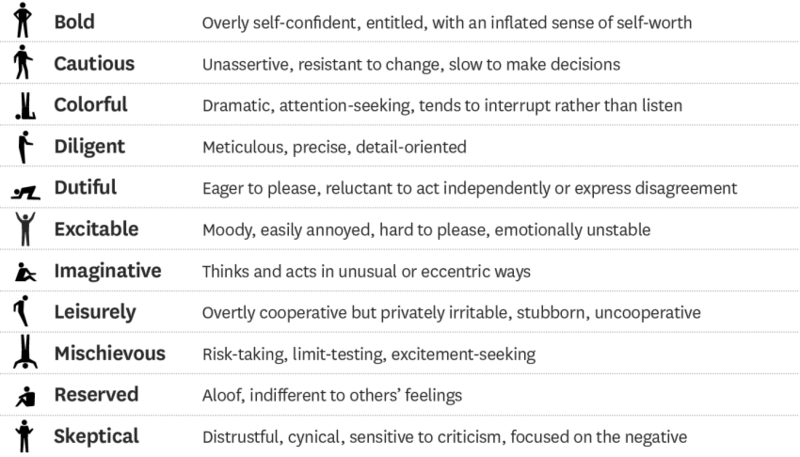 Two decades ago the psychologists Robert and Joyce Hogan created an inventory of these “dark side” traits—11 qualities that when taken to the extreme, resemble the most common personality disorders. Since then their related assessment, the Hogan Development Survey (HDS), licensed by the eponymous company with which I am affiliated, has been widely adopted within the field of industrial-organizational psychology as a way to identify individuals’ development needs. After profiling millions of employees, managers, and leaders, we know that most people display at least three of these dark-side traits, and about 40% score high enough on one or two to put them at risk for disruption in their careers—even if they’re currently successful and effective. The result is pervasive dysfunctional behavior at work. Worryingly, leaders tend to do a poor job of evaluating their own dark sides, particularly as they gain power and move up the ranks. Some perceive their career advancement as an endorsement or encouragement of their bad habits. Eventually, however, those weaknesses may derail them, and perhaps their teams and organizations, too. For example, cautious leaders may convey the illusion of control and risk management in the short term, but being overly cautious may cause them to be so risk-averse that they obstruct progress and innovation. 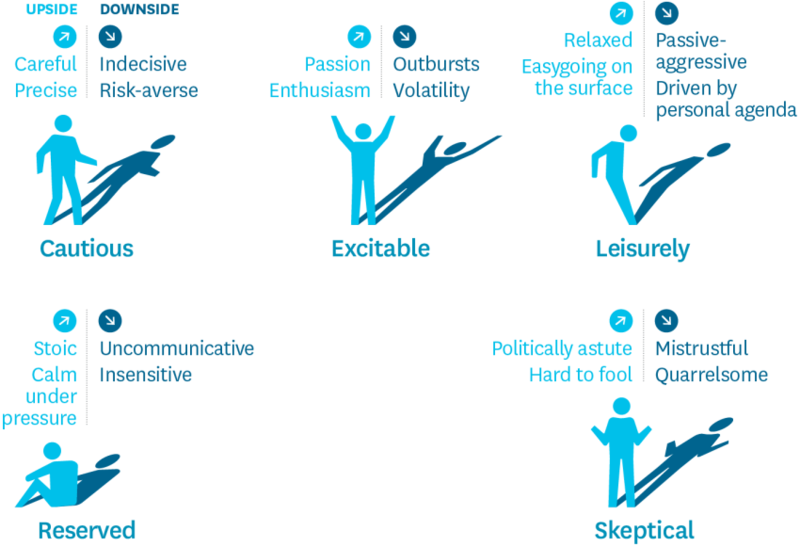 Being excitable may help you display passion and enthusiasm to coworkers and subordinates, but it can also make you volatile and unpredictable, which is taxing to others. Diligence helps you pay attention to details and strive to produce quality work, yet in excess it can morph into procrastination and obsessive perfectionism. Research over decades suggests that it’s very difficult to change core aspects of your personality after age 30. But you can—through self-awareness, appropriate goal setting, and persistence—tame your dark side in critical situations, by changing your behaviors. Your Dark-side traits can be divided into three clusters. Those in the first are distancing traits—obvious turnoffs that push other people away. Being highly excitable and moody has this effect, for instance. So does having a deeply skeptical, cynical outlook, which makes it hard to build trust. Another example is leisurely passive-aggressiveness—pretending to have a relaxed, polite attitude while actually resisting cooperation or even engaging in backstabbing. Traits in the second cluster are, in contrast, seductive qualities—geared to pull people in. They’re often found in assertive, charismatic leaders, who gather followers or gain influence with bosses through their ability to “manage up.”But these traits can also have negative consequences, because they lead people to overestimate their own worth and fly too close to the sun. Being bold and confident to the point of arrogance is a good example; so is being puckishly mischievous, with an enormous appetite for reckless risk. The third cluster contains ingratiating traits, which can have a positive connotation in reference to followers but rarely do when describing leaders. Someone who is diligent, for instance, may try to impress her boss with her meticulous attention to detail, but that can also translate into preoccupation with petty matters or micromanagement of her own direct reports. Someone who is dutiful and eager to please those in authority can easily become too submissive or acquiescent. If you are unable to complete a full psychological assessment to identify your potential derailers, you can take an abbreviated version of the HDS at www.hoganx.io (with registration required) or simply compare your typical patterns of behavior with the basic profiles of the traits. Even better: Ask bosses, peers, subordinates, and clients to give you honest and critical feedback on your tendency to display these traits. Tell them that you want to improve and need their candor. How do they see you when you’re not at your best? 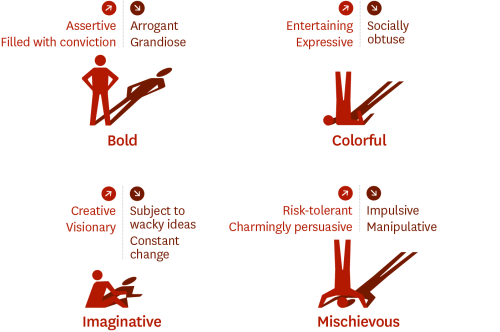 Do any of the traits sound a little (or a lot) like you? You might mention a pattern you’ve noticed or that others have commented on. You can improve your self-awareness through formal feedback mechanisms, such as performance appraisals, 360s, check-ins with your manager, and project debriefs. The key to gathering accurate information is to recognize that people will generally avoid offering critiques, especially to leaders, unless the behaviors are truly egregious. So in addition to assuring them that you welcome their honest assessments, you should listen carefully for subtle or offhand remarks. Remember, too, that people in your personal life are likely to be more familiar with your dark side than work colleagues are, so ask for their candid opinions as well. At work you’re often on your best behavior. In private, when you’re comfortable being yourself and are relatively unconstrained by social etiquette, you’re more likely to show your true colors. To control your dark-side traits long-term, you’ll need to view reputation management as central to your development. This may seem like a superficial strategy for change, but career advancement is a function of how people see you. When your dark-side traits negatively affect others’ perceptions of you, they become barriers to career success and good leadership. Unfortunately, even small slips—ignoring negative feedback when you are bold,responding to unpleasant e-mails in an impulsive manner when you are excitable, or getting carried away by awkward ideas when you are imaginative—can cause significant reputational damage. To be sure, taming your dark side is hard work. Most people don’t really want to change—they want to have changed. But if you identify the traits that trip you up, modify certain behaviors, and continue to adjust in response to critical feedback, you will greatly enhance your reputation, and with it your career and leadership potential. Source: Upcoming September–October 2017 issue (pp.138–141) of Harvard Business Review.